One (1) VIN License open to use. 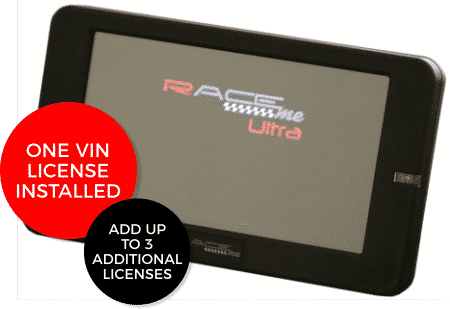 We load the extra VIN licenses onto the Ultra before shipping. You will be redirected after adding the RaceME Ultra to your cart. RT (Real Time) Programming fully supported for all trucks 2007.5- 2018. The 2007.5-2009 trucks now support RT functions with Box tuning in Software versions RAME007A and newer. Real Time allows customer to program truck on the road to every stage he wants, with different adjustments in duration, timing, VGT and rail pressure to the level he wants. Simply by pressing the “Send” button, the adjustments are instantly available and programmed. Raised line pressure in all Fwd gears AND during the shifts. Increased shift firmness for less slip in the clutches. Changed shift points at WOT in all gears @ 3000 RPM. No Special / Complicated Unlock Procedures Required, Connect Necessary Cables And Install Tune! Tune Uses Latest High Speed Transfer, Usually Takes 7 Minutes Max! Monitor Comes With User Defined Layouts/ Dashboard. New look for 2018!! Allows adjustment of Pressure thresholds for all TPMS (Tire Pressure Monitoring System) equipped trucks. Product does not support the removal of the DEF tank and its associated components! !